After almost a month in my mom’s place pampered with good and high calorie food (at times) and no exercise, it’s time for me to get back to my fitness & healthy diet routine. It took almost 10 days for me to be regular to my gym and finally now I started cooking some healthy food. One such dish which I often do at my home is the Avocado Paneer Masala. 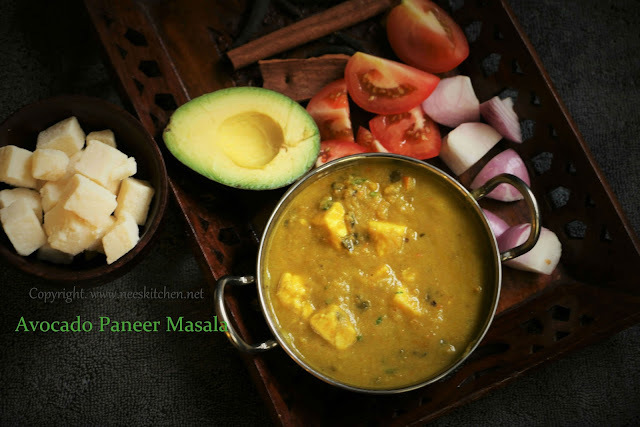 The naturally nutty flavored & creamy textured avocado is combined with tomato onion & dried methi masala gravy and finally loaded with paneer is a good substitute of the regular paneer butter masala which has cream & cashew. Avocado is loaded with vitamins & nutrients. We call it as butter fruit in India. It has a myriad of health benefits. Consuming avocado regularly would reduce the risk of high cholesterol, obesity, diabetes. 1. Peel & Chop avocado, onion, tomato into big cubes. 2. Blend avocado, cardamom and saffron with water. 3. Take a cooking pan add 2 tsp of oil and fry onion until half cooked. 4. Switch off the gas and add the tomatoes to the fried onion. Let it cool. 5. Blend Onion, tomato & green chili into a nice paste by adding water. 6. Take a cooking pan, add oil. 7. Add cinnamon , Marati moggu , Kalpasi and let it fry nicely. 8. Add the tomato onion paste to this and let it cook nicely. 9. Once cooked add little water and add turmeric, chili powder, coriander powder and salt. 10. Let this cook nicely and let the gravy become thick. 11. At this stage add dried methi leaves and cook for 3 – 5 minutes. 12. Add the avocado mix and stir well. Add the remaining water. 13. Bring it to boil and let it start to thicken. At this stage add the paneer and let it cook for 8 to 10 minutes. Avocado Paneer Masala is ready. Olive Oil can be replaced with ghee. The measurement of water given in the ingredient list is used during various stages of cooking this recipe.